I bought Jingo at Newtown Horse Sale in October 1989, or rather I bought a pair of flickering cream ears and flying blonde mane; which was all I could see above the crowd of farmers and dealers round the little cattle market. He was eighteen months old, part Welsh Cob, newly gelded, barely halter broken and extremely annoyed about the whole situation. He cost 170 guineas; skid row money at a skid row market. I’d never owned a Welsh Cob, let alone a cream coloured one; however he was all I could afford. Little did I know that this wild and backward yearling would have a huge impact on my life. I turned him out with another yearling, a friendly little chap, who helped Jingo relax and settle down. By the Spring, he looked very different; a spectacular dappled palomino, full of Cob fire and presence, and I was thrilled with his progress. He was so quick to learn and eager to please, and by the time I backed him in the summer of 1991 I knew that I would never part with him; he had the makings of a good all-round Riding Club and fun cob and I was full of plans. In April 1992, I moved him up the road to a friend’s yard – she had far less grass than me and I’d have company when I started riding him out. It seemed such a good idea at the time…. We had some wonderful rides, and I shall never forget these lovely Spring days; Jingo looked grand as he started to muscle up and gain confidence. He was a joy to ride and I was so proud of him, my beautiful golden Cob, who had overcome so much and now had such a bright future. Six weeks on, and a bright mid May morning. Jingo had colic – impacted, I thought, no gut sounds, and he’s been eating the hedge as there’s not much grass. The day wore on and turned into a nightmare. My vet mentioned grass sickness, and at some point during that terrible afternoon Jingo seemed to rally and towed me round the yard, talking to each of his stable mates in turn; I knew in my heart that he was saying goodbye and that all hope was gone. Early the following morning he was put down and acute Grass Sickness was confirmed by post mortem. Never in my life have I known such utter desolation. Fifteen years have gone by since that dreadful time, and I now have four Welsh Cobs in my life, treasured friends all. It’s hard not to suffer from paranoid owner syndrome, and anyone who has had a GS loss will know exactly what I mean. Shortly after losing Jingo I got in touch with the EGSF, and as I’m an equine sculptor who takes a trade stand around the Welsh Borders, I’m able to sell GS merchandise and give leaflets and information out at events. It’s surprising how many horse-owners round here have never heard of it – however I’m from Central Scotland and was all too familiar with it in my Pony Club days, and before losing Jingo I’d thought it was just a Scottish problem, so I was just as bad. For some time now I’ve been wanting to do a bit more to help the Fund, so last year I suggested to Joyce that I make a limited edition model with a donation for each one sold. 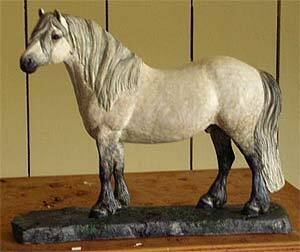 She suggested a Highland pony as so many of them have been lost down the years to GS; and at last the model is in production. 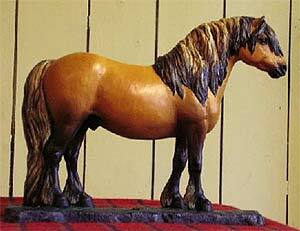 It was difficult to find a nice typey pony in this area to use as my model – so eventually I focused on a Highland pony we’d had years ago, a jolly swaggering character called Fergusdene, and as soon as I recalled him in my mind’s eye, the model started to take shape. I’m delighted to say that the limited edition of 50 has all sold now and it was wonderful to be able to help the Fund.